Gregg Popovich got his 2016 press conference season off to a roaring start at Spurs media day on Monday. He verbally jousted with reporters who asked unclear or repeated questions, stated that he will be fining Tim Duncan $2,500 daily until he shows up, and declared Duncan “Coach of Whatever He Feels Like.” Then, the Spurs head coach spoke thoughtfully about social issues for half of his time with the media. His eloquent musings on race and politics were more open and revealing than most of what he says about his basketball team. Nine minutes into the video, a reporter asks for Popovich’s thoughts on social issues, police shootings, and what’s going on today. 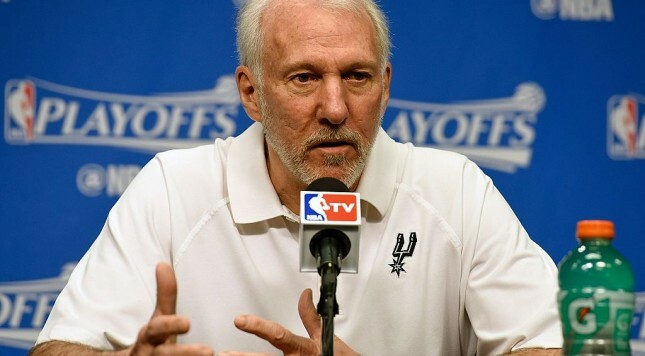 Vague questions are the bane of Popovich’s existence, especially if they include the phrase “can you talk about” or “what are your thoughts.” While Pop did lament that the question was unspecific, he did so respectfully because he felt that the topic is very serious and deserves a proper conversation. Some may ask why a basketball coach has to talk about any of this, why he can’t just focus on Xs and Os and his players. The reality is that sports and social issues are very much intertwined, and few understand that reality better than Popovich. He routinely gives his players history lessons and engages them in conversations about topics bigger than basketball. Question: About a year ago you invited Dr. John Carlos to talk to your players about the importance of taking a stand (Carlos famously raised his fist on the podium at the Mexico City Olympics in 1968). Can we conjecture that you support those athletes who are now taking a stand, football players and WNBA players and so forth? Popovich: I absolutely understand why they’re doing what they’re doing, and I respect their courage for what they’ve done. The question is whether it’ll do any good or not, because it seems that change really seems to happen through political pressure. No matter how you look at it, whether it’s Dr. King getting large groups of people together and boycotting buses, or what’s happened in Carolina with the NBA and other organizations pulling events to make it known what’s going on. But I think the important thing with what Kaepernick and others have done is keep it in the conversation. When’s the last time you heard the name Michael Brown? With our 24/7 news things seem to drift. We’re all trying just to exist and survive, and it’s easier for… white people because we haven’t lived that experience. It’s difficult for many white people to understand the day to day feeling that many black people have to deal with. It’s not just a rogue policeman, or a policeman exerting too much force or power when we know that most of the police are trying to do their job which is very difficult. I’d be scared to death if I was a policeman and I stopped a car, you just don’t know what’s gonna happen and part of that in our country is exacerbated by the preponderance of guns that other countries don’t have to deal with. It gets very complicated, and at this point when somebody like Kaepernick brings attention to this, and others who have, it makes people face the issue, because it’s too easy for people to let it go because it’s not their daily experience, and if it’s not your daily experience you don’t understand it. I didn’t talk to my kids about how to act in front of the policemen when you get stopped. I didn’t do that, but all of my black friends have done that. There’s something that’s wrong about that, and we all know that. What’s the solution? Nobody’s figured it out, but for sure the conversation has to stay fresh, it has to be continuous it has to be persistent, and we all have a responsibility to make sure that that happens in our communities. Question: Do you plan on, if any of your players would like to protest, do you plan on talking to them about it or supporting them at all? Popovich: My players are engaged citizens who are fully capable of understanding what their values are what they think is appropriate and inappropriate, what they feel strongly about, and whatever actions may or may not be taken are their decisions. I’m not gonna tell anyone ahead of time that if they don’t do A, B, and C they’re gonna be gone, or they’re traded. I think that’s ignorant. Popovich’s answers reveal a genuine, non-partisan empathy for groups of people that face different challenges than he does. It’s refreshing in today’s polarized political climate, and Pop’s ability to put himself in other people’s shoes is a big part of what makes him an incredible coach. The Air Force Academy graduate was also asked if he agreed with the method of protesting the national anthem. “I think to each his own, I think it depends on a person’s life experience, and what they value and how strongly they feel about it. I don’t think instant condemnation of any sort of act should happen until it’s thought out,” Popovich said. Popovich hasn’t come out and said which candidate he supports in the 2016 election, but one can make an inference based on his comments on the issues. He donated $5,000 to Barack Obama’s 2012 campaign, and he had lunch in San Antonio with former president Bill Clinton in 2014. The conversation took a natural turn to tonight’s debate between Hillary Clinton and Donald Trump. For years people have been more than half serious in telling Pop he should run for office, and moments like these are a big part of the reason why. It’s easy to picture him sipping a nice red wine in the Oval Office, talking on the phone with Vladimir Putin in fluent Russian. A term as president might be the only way to take his already legendary press conferences to the next level, and the White House Correspondents dinners would be historic. An unlikely presidential run aside, today Popovich showed again that he puts deep thought into the issues that many Americans face. He actively tries to understand what other people go through on a daily basis because he seems to truly care about those people, about all people. That empathy has helped him connect not just with players as a coach, but also with the community as an active and positive member.